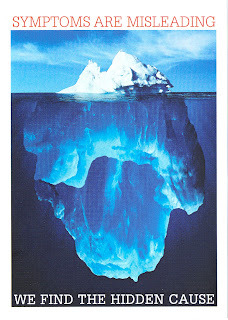 The tip of an iceberg is misleading as to its actual size beneath the water, just like symptoms are misleading as to their actual cause. A structural imbalance is often the underlying cause of secondary conditions (symptoms) as listed above. All too often we hear about various health care professionals attempting to address what is really a SYMPTOM of something more significant. It's like someone who keeps discovering cracks in their dry wall. They keep attempting to fill in the cracks, when what they SHOULD be doing is focusing FIRST on the foundation and internal structure of the home. Anything else is considered a temporary patch job. There are FOUR signs that are absolute indicators of a structural imbalance. The first is a structural shift. 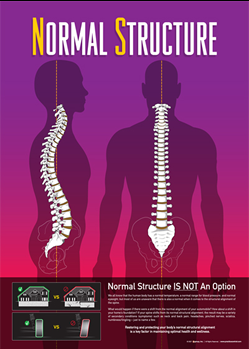 The second is loss of the normal curves in the spine. The third is compressed discs. And the fourth is degenerative bones. If one or more of these INDICATORS reveals a Structural Issue or imbalance, then it stands to reason that your structural issue is likely to be the underlying primary cause of your secondary condition / symptom. What we often find is that other health care providers, who certainly mean well, will throw anything and everything at the secondary condition without ever considering the underlying structural issue. This is usually due to the fact that they are not trained in detecting and correcting structural issues...in the same way that I am not trained in mixing prescriptions. Does that make sense?